DatePart(DatePart, Date) - Returns an integer representing the specified DatePart. This function is simialar to DateName(). DateName() returns nvarchar, where as DatePart() returns an integer. The valid DatePart parameter values are shown below. DATEADD (datepart, NumberToAdd, date) - Returns the DateTime, after adding specified NumberToAdd, to the datepart specified of the given date. DATEDIFF(datepart, startdate, enddate) - Returns the count of the specified datepart boundaries crossed between the specified startdate and enddate. 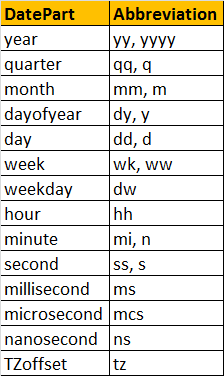 Consider the emaployees table below. Write a query to compute the age of a person, when the date of birth is given. The output should be as shown below. Using the function in a query to get the expected output along with the age of the person. Your video tutorials are of great help to any serious developer,It helps to clear concepts with clarity. Thanks for all the effort you have put up to group the tutorials in logical order. I am getting this error.. Can any one guide me how to resolve this??? Arithmetic overflow error converting expression to data type nvarchar. Pls check, getting days count in your function. how do i can take this query into a trigger that check the age and rollback when it's not in the range? Hi, I am getting this error "Arithmetic overflow error converting expression to data type nvarchar." I did exactly what this video says. Hi I have to calculate the financial year .. which start from 1 July and ends with 30 June ..how to calculate..